Home » Pitter Patties: A Nutritious Option For Families On-To-Go! As a vegetarian family that tries to maintain a healthy and natural diet it can be a challenge to find kid friendly convenience foods. That is why I was excited to find out about Pitter Patties. These frozen muffin-shaped casseroles contain all natural ingredients, serve up about 10 grams of protein, taste great and only take 1.5 minutes to prepare. These are perfect for the family on the go and are great to pack along in the kids lunches. 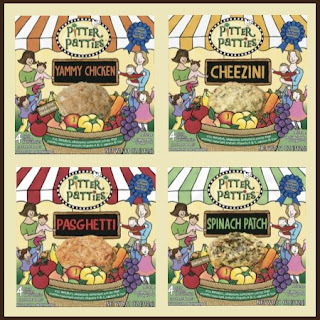 Pitter Patties come in a variety of flavours with options for specialized diets: vegetarian, vegan, gluten/wheat free, dairy free and even a hormone and antibiotic-free chicken entrée. Even though they were created with children in mind and are great beginner food for the baby has passed the pureed food stage, they are also enjoyable for older children and adults. My three year old son was especially fond of the Cheezini Patty and I am addicted to the Pasghetti Patty. I love the homemade taste. Yammy Chicken – An interesting combination of hormone and antibiotic- free chicken, fresh yams, crisp apples and brown rice. Gluten, wheat and dairy free. Zucchini Cheezini – A delightful, vegetarian blend of garden zucchini, mushrooms, natural cheeses and whole grain oats. Wheat free. Pasghetti – whole grain pasta together with savoury tomato sauce and natural cheeses. Vegan Patty – A vegetarian blend of legumes, quinoa, veggies & spices baked into a delectable muffin-sized casserole. Vegan , gluten , wheat & dairy free.